As Beehover release their new album ‘The Devil And His Footmen’, which was once again handled by Exile on Mainstream, the year 2013 also see’s this eccentric bass and drum duo hit it’s 10 year milestone as an active band, and with a short tour of their native Germany happening next month as well as an extended European tour in the works for 2014, I fired a few questions over to drummer Claus. Hey Claus , hope your keeping well as summer turns into autumn, so how is life treating at the moment in your homeland of Germany? We’re very busy with Beehoover business at the moment, like sorting out all the merch stuff and we’re looking forward to the upcoming tour. We’re also making plans concerning gigs and tours for 2014. Besides that the trees are turning yellow, it’s getting cold and the birds are leaving. 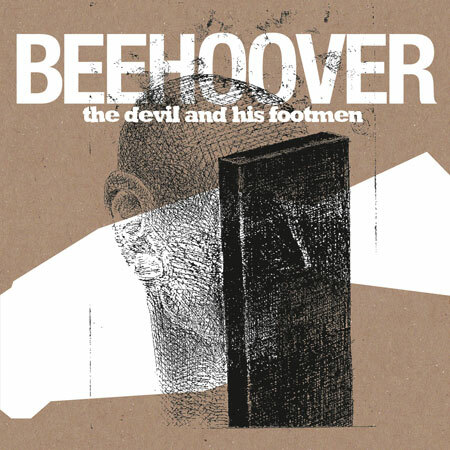 You’re quite a difficult band to describe and avoid all pigeon holes, so to someone new to the band how would you sum up the sonics of Beehoover? We play rock music with a naive approach to structures and songwriting. We cover all dynamic stages from silence to noise and make people dance in an awkward way. 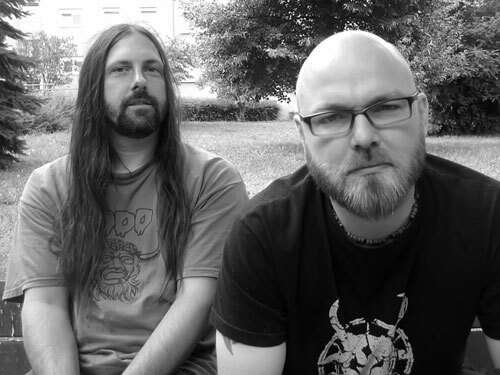 So 2013 see’s the 10th Anniversary of Beehoover being an active band, did you ever think you’d reach this far as a 2 piece without killing each other? In the beginning we were a bit worried how people would take a band like us of course. Turned out it went alright. We’ve never thought about quitting and although we get into a rant with each other once in a while we really get along very well and our musical relationship is exceptional close. We’ve developed a similar way of working in a way that must appear chaotic to outsiders. We’re an all democratic band, all we do is decided by the majority of us two so whatever we do each band member stands behind it 100%. It’s a privilege to be able to continue this band besides families and daytime jobs. And what have been the highs and lows during those 10 years? There haven’t been any lows really except some crappy gigs. The biggest high is being rewarded for the hard work by people all around the world who really appreciate what we do. And there were excellent gigs, I remember the one in Lille where hell just broke loose, people went stagediving and crowdsurfing despite the shattered glass covering the floor. Or the one at the Stoned From The Underground festival in front of 1500 people. 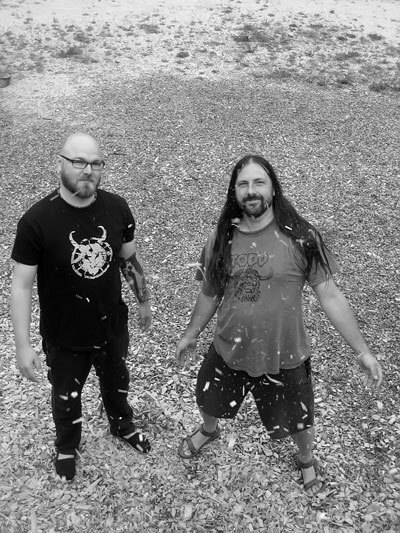 Your new album ‘The Devil And His Footmen’ is out now, so far what has the response been like to the new recording and are people starting to ‘get you’? Overall the responses have been good, some even enthusiastic. However there are also some ambivalent reviews. It’s interesting what critics seem to have expected from this album and what they find or miss in it. However, we sometimes don’t understand their points and not really sure they get it. It was once again released by Exile On Mainstream Records who seem to becoming a bit of a spiritual home for Beehoover, so how’s it been working with Andreas and will it be a working relationship that you hope will continue? Working with Andreas is great! He gives you all the respect and possibilities you probably couldn’t expect from a record label as an artist the size we are. We hope that we can continue this. Being just a two piece, how to you write and develop your songs in the rehearsal room, is it purely from jamming together or do you already have ideas/riffs floating around which you then build on? We don’t rehearse on a regular base. If preparing for an album we work on parts Ingmar has come up with. We record all the bits and pieces with and without drums and listen to them again and again until we get a picture, which of them will make it to the record and how they can possibly fit together. We listen to it not from a musician’s but from a fan’s point of view. This period can take years and we then finally produce songs out of those bits within a couple of days of serious work. Would you ever consider adding a guitarist or is that simply not Beehoover? We tried in the beginning but couldn’t find someone. Perhaps it was due to us having jammed together for 2 years at that point already and being used to each other musically so well. We don’t wanna make a fuss about it, it’s good as it is and we’ve never felt the need to change a thing. Anyway being a two piece is not a big topic nowadays, is it, and we want people to listen to the music no matter what the constellation is. From a current point of view I’d say that if we feel the need for a guitarist (or some other instrument) for creative reasons this wouldn’t be Beehoover anymore. The tools we have are enough to express ourselves. Can you give us an insight into your lyrics and where the ideas come from, does Ingmar handle them or is it a joint effort between you both? Lyrics are important to us. We tried to write them together in the beginning but we differ a lot from how we write them. Ingmar’s grow over several months whereas mine are mostly lurking inside for ages until I write them down within a minute. We sometimes cover historic topics, such as Stanislav Petrov, but very often it’s metaphorical language about emotions or such. Although the new album isn’t a concept album there was a certain prevailing mood when we wrote it, which was a bit critical on society. It’s about people, whose aim it is to be absorbed by the mediocrity of our society. Who criticise anything besides the mainstream but don’t really know about it whilst claiming broad knowledge and social competence for themselves. You know what we mean? Ingmar’s bass tone is incredibly distinctive, so can you give us a rundown of the equipment both Ingmar and you use? Ingmar aimed for a bass setup that allows him to play through a broad variety of amps and speakers and still get his sound as you never know what gear to expect on a festival stage. So his two Kustom amps are quite neutral and he doesn’t use any tone control on them. He uses two 2×10 and two 1×15 custom built cabinets equipped with Eminence speakers , several effects (distorion, chorus etc. ), Spector basses, EMG Pickups and Thomastik Infeld strings as well as Sommer cablesand Lehle switches. However the source of his sound lies in his hands. I use a three piece Troyan drumkit with a DW snare and Sabian, Paiste and Class cymbals as well as Los Cabos drumsticks. We haven’t changed our equipment for years, use what we have and are happy with it. You’ve also been booking a European tour to support the release of ‘The Devil And His Footmen’, how’s this going so far, any confirmed dates you can tell us about and feel free to use this space to ask for help with any remaining dates. We are just putting together a tour for the UK and so far we have confirmed dates for London, Cardiff and Bristol as well as some others still to be confirmed. We’re also working on festivals and more weekend mini tours. If someone in England, Wales, Ireland or Scotland wants to put on a cool Rock n Roll show, feel free to contact us. Which do you prefer, recording and rehearsing, or getting out on the road and playing live? We like both. The whole process of creating an album is very exciting. We do a lot ourselves, like recording, mixing, we decide about artwork and all that stuff. It’s great to start off with a little idea and actually hold an album in your hands just a few years later. On the other hand playing gigs is what you do all this for. It’s just incredible to be rewarded for your efforts by an enthusiastic audience. Be credible and have a point!